The MASCOT CavFlo trim effectively minimizes cavitation damage to control valve components by controlling the location of vapour bubble implosion in an area away from metal parts. Cavitation is a two-stage process: First, as fluid velocity increases through the restriction at the vena contracta, the pressure of the flowing liquid drops below the vapour pressure causing vapour bubbles to form. Second, as the flow enters the enlarging passageway downstream of the vena contracta, the velocity decreases. The resultant pressure recovery raises the fluid pressure back above the vapour pressure, causing the vapour bubbles to collapse or implode. The implosion of the bubbles on metal surfaces stresses and eventually tears away particles of the metal. Throttling in most globe valves occurs at the restriction created by the clearance between the valve plug and seat ring; therefore, both can be severely damaged by cavitation. In addition, imploding vapour bubbles near the valve body and adjacent piping can also cause damage. The Solution: CavFlo Trim: MASCOT CavFlo trim utilizes a number of small, diametrical flow holes through the walls of the seat retainer. As the valve plug lifts off the seat, increasing pairs of holes are opened. 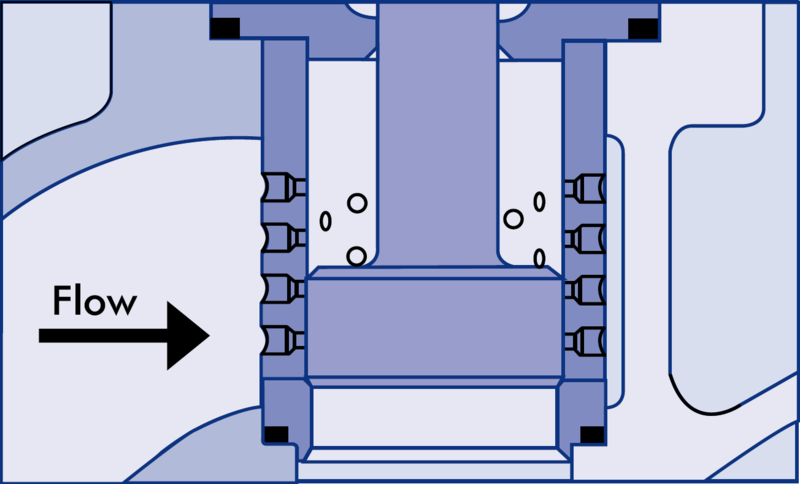 Each hole admits a jet of cavitating liquid, which impinges in the center of the retainer upon the jet of liquid admitted through the opposing hole. The impinging fluid jets form a fluid cushion and an area of pressure recovery that cause the collapse of the vapour bubbles in the fluid stream away from metal parts. Stepped holes are used to ensure orifice type flow rather than tube type flow through the retainer; thus, the vena contracta is established externally rather than inside the retainer itself. The turbulence of the impinging flow promotes the collapse of vapour bubbles at the center of the seat retainer, minimizing damage to valve trim. The valve plug fits the retainer closely, controlling the fluid flow through the holes. Therefore, the fluid must be fairly clean to avoid sticking and galling problems between plug and retainer. 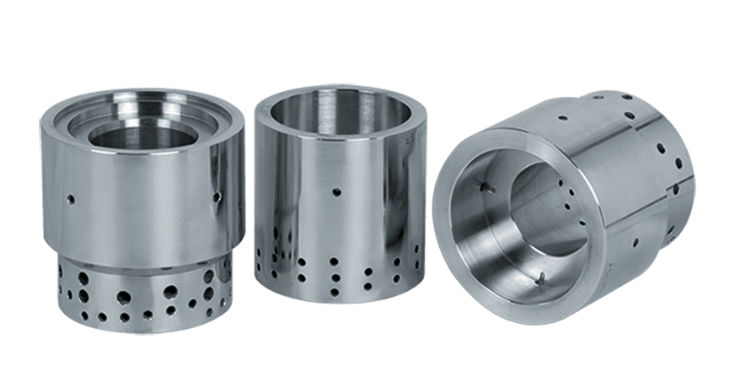 Multistage CavFlo: The CavFlo multistage cartridge may appear similar to other competitive designs because of its drilled holes and close-fitting cylinders but here the similarity ends. Rather than acting as a flow restriction, the drilled holes in the CavFlo multistage cartridge are used as expansion areas for the fluid as it enters from restrictive channels machined in the outside of all interior cylinders. This prevents the fluid recovery from occurring adjacent to a critical trim surface. Successive intersections of the restrictive channels result in additional pressure losses while expansion holes connected to the channels create a series of expansions and contractions that result in a series of pressure drops. This staged pressure drop eliminates cavitation in most applications and minimizes the energy of cavitation that may still occur in others. No Clogging Design: Anti-cavitation valves are typically constructed with small flow passages that can become plugged by dirt or other debris in the fluid stream. Such devices usually direct the flow initially to the throttling plug before passing it through the restrictive device. This results in sticking and galling as dirt and other material become trapped between the sliding plug and the inside surface of the anti-cavitation device. On the other hand, CavFlo is designed with two important protective features to minimize such plugging problems: First, flow is first brought through the cartridge; contaminants too large to pass through the small outer channels are trapped at the outer-most stage of the cartridge preventing debris from traveling through the device to the throttling plug. Second, because the inner channels progressively become larger, small particles (which pass through the first set of channels) are easily passed through the rest of the cartridge. In the unlikely event that the cartridge does become plugged, it can be easily disassembled and cleaned as the cartridges are never welded together.